The news that George and Robert Soros own 3,114,588 shares in Manchester United has led to some confusion about the number of shares the club has and hence the relative size of this stake. This is a quick guide. Before the IPO on 9th August, the club's share structure was reorganised to create two classes of shares, "A" Shares and "B" Shares. 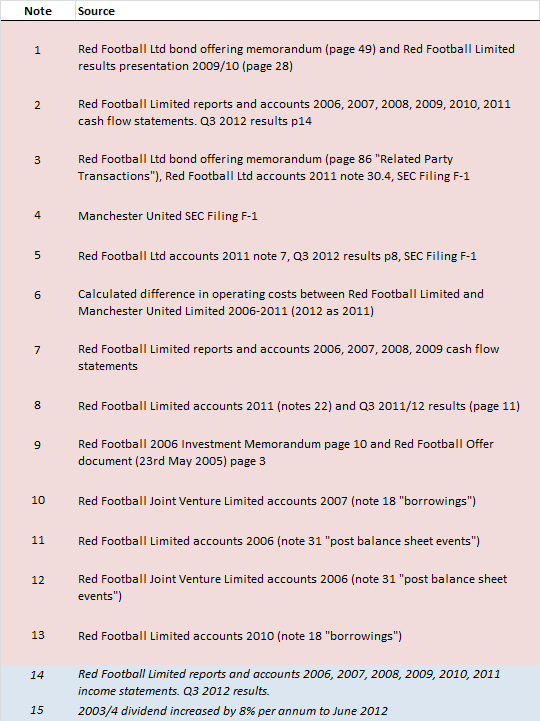 Red Football LLC, the Glazers' Delaware company owned 100% of each class of share. The IPO was an offer of a total of 16,666,667 "A" Shares at $14 per share. No "B" Shares were offered. This total offer had two separate elements, the issue of 8,333,334 new "A" Shares by the company and the sale of 8,333,333 existing "A" Shares by the Glazers. The first element had the effect of increasing the total number of "A" Shares from the 31,352,366 before the offer to 39,685,700 afterwards. The number of "B" Shares remained unchanged. 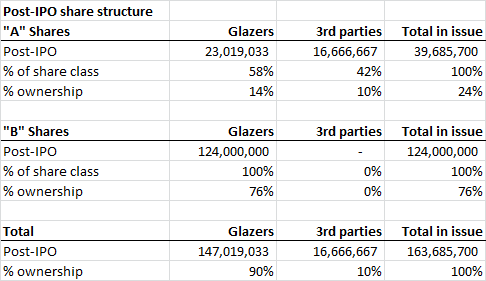 The Glazers therefore ended up owning 58% of the "A" Shares and 100% of the "B" Shares, so 90% of all the shares in issue. Third party investors own 42% of the "A" Shares and none of the "B" Shares, so 10% of all the shares in issue. Each "B" Share has 10 votes, and each "A" Share has 1 vote. Because of this structure the 10% of total shares owned by third parties only command 1.3% of the company's votes. In aggregate all the "A" Shares representing 24% of the company, only command 3.1% of the votes. The Soros family bought 3,114,588 "A" Shares in the IPO. That is a pretty significant 18.7% of the shares sold in the IPO, but only 7.85% of the total number of "A" Shares and 1.9% of the whole company. Being "A" Shares this stake only has 0.24% of the votes. At a price of $14 per share, the Soros family paid $43.6m for this stake. At yesterday's closing price of $13.06, the stake is now worth c. $40.7m. So the Manchester United IPO has finally happened. Having failed in Hong Kong and Singapore, the Glazers and their increasingly desperate bankers ditched their own ludicrous $16-20 per share price range and the shares have limped on to the NYSE at a still very, very aggressive price of $14 per share. The whole saga has been a grubby and unedifying spectacle in our club's history that does very, very little indeed to improve the club's finances. The whole exercise has only been undertaken to help the Glazer family with their cash flow problems. From the latest SEC filing we have confirmation that at the lower issue price, the club will receive net proceeds (after underwriters' discounts and commissions) of c. $110.3m (around £70.7m). The club will use all this $110.3m to repay $101.7m face value (£63.6m) of the 2017 US$ notes at a price of 108.375% of nominal value. This net saving is the equivalent of the matchday income from one game at Old Trafford. It is just over 1% of the club's annual revenue and around 3-4% of EBITDA. Before any United fans begin celebrating this tiny saving, there is a further sting in the tail. The prospectus informs us that the club, and not the family, will bear the expenses of the IPO. From page 151 we can see that these expenses total $12.3m (c. £7.9m). With so little debt repaid and United bearing the £7.9m of expenses, it will take until the end of 2014 for the club to even break-even from the IPO, let alone benefit financially. And the Glazer family? They receive their $110m straight away. Readers will no doubt have seen Sir Alex Ferguson's statement that he will not benefit financially from the IPO. As one of the people suggesting he was likely to participate in the $288m "2012 Equity Incentive Reward Plan" the club are putting in place, I'd like to apologise to Sir Alex for the suggestion that personal gain was a motivation in his support for the owners. I think it was a valid question to ask in the light of his comments about "real fans" last week, but I was wrong about my assertions. I have frequently stressed on this blog the miracles Sir Alex has achieved at United and was proud to promote the SAF25 fans' book last year. I'm extremely glad he is not caught up in the murky finances of our club. The key issue with the IPO is not however the share options that will be granted, but the continuing financial costs to the club of the Glazers' ownership. I thought it might be helpful to set out the costs and savings that stem from the financial structure that has been in place since 2005. There have been a few comments on this blog questioning the financial costs of ownership so I wanted to set them out again in full with full sources. The costs divide into several categories. 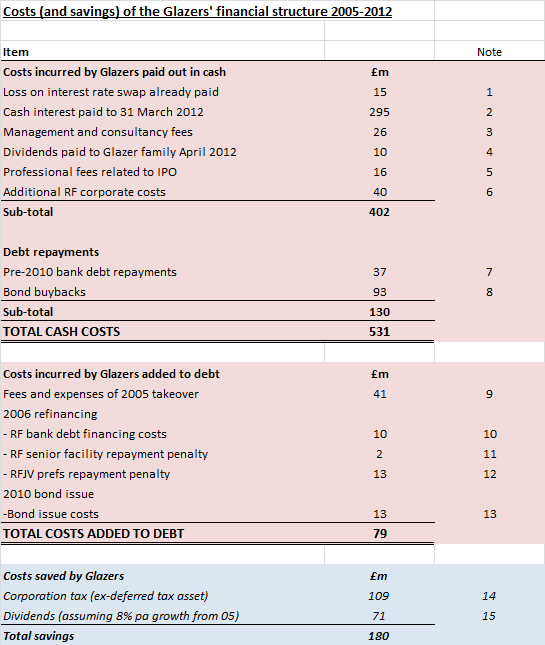 Firstly "cash costs" of £402m, money paid out of the club's coffers. The most important element of this is interest (£295m). Second are the limited repayments of debt since 2005, these comprise £37m of the original bank debt and £93m of repurchased bonds. Please note I have not included the repayment of the PIKs as the club did not pay for this. Adding these together we get costs of £531m, around two thirds of United's total wage bill over the last seven years to put the figure in context. For information I have also set out various costs paid by the taking on of additional debt rather than paid out of cash flow. I have not added this £79m to the £531m as there would be an element of double counting (I include repayments in the cash costs so can't include debt additions too). There are two key savings from the financial structure totalling £180m, firstly the dividends which the plc used to pay and secondly corporation tax saved because interest payments are tax deductible. I have assumed dividends would have increased 8% per year from 2006-2012. This compares to 7.6% per year growth in the seven years up to the takeover and is faster than the 7% growth in EBITDA seen since the last full year of the plc (2003/4). Corporation tax is as set out in the Manchester United Limited accounts (but not paid because of deductible interest higher up the corporate structure). The net cost: £531m - £180m = £351m is a vast number. It is the gross transfer spend of the club in the ten years from 2001/2 to 2010/11. It could alternatively have funded a 60% ticket price cut in every year since the takeover. It could have been used to build out Old Trafford to be a 100,000 seat stadium. It was used for none of these things. It is the cost in cold hard cash of the Glazers' ownership. Crucially, this figure ignores the fact that even after all this waste of money, the club still has £437m of debt on the balance sheet and that this will still be around £360m after the IPO. The IPO is a huge wasted opportunity to stop this enormous outflow of money from Manchester United. The SEC F-1 prospectus confirms that the IPO will only reduce the club's debt by around £78m, saving (after tax) only around £5m per year. Longer term, the IPO will cost the club more each year in higher US taxes (the corporate tax rate is 35% vs. 24% in the UK). The real beneficiaries of the IPO will be the Glazer family who will receive around $150m from their sale of 8,333,333 shares and the unnamed senior executives (but not Sir Alex) who will be entitled to 16,000,000 shares under the "2012 Equity Incentive Reward Plan". All these people will make money and the club will be left with the vast bulk of its debts. The IPO gives no opportunity for supporters to take a meaningful stake in their club. The shares on offer represent 10% of the club but with under 2% of the votes. It has been mentioned by some people that the club is constrained by the bond terms as to the amount of debt it can repay. It is true that until 2013, the club can only repay 35% of the bonds. That figure is £182m compared to the £78m the IPO will repay. It is in any event only five months until this restriction falls away. If this IPO was about paying down debt, the vast majority of the $300m (£193m) proceeds could be applied to debt repayment today, with the balance being applied in January. People have queried my "agenda". My agenda remains the same. I want Manchester United run for the glory of Manchester United, not to make money for owners who do not care about it. I want the money United makes to be ploughed back into the club, invested in players, stadium and cheaper tickets, not wasted on financing costs. I want debts taken on only to expand the facilities of the club. This is not a pipe dream. It is how almost every European football club is managed, for the glory of the club. It is how the other financial titans; Barca, Real and Bayern are run. In the video presentation they confirm that the club's transfer budget in the future will usually be a net £20-25m, the average spend over the last fifteen years. That is a choice being made by the Glazers, more concerned with maximising profits. A debt free United run like a normal football club could afford to compete with biggest clubs in Europe, we aren't even trying.